The New York Giants have released kicker Josh Brown following the release of notes from his personal journals in which he admits to being “physically, mentally, emotionally, and verbally” abusive to his wife, Molly. We believed we did the right thing at every juncture in our relationship with Josh. Our beliefs, our judgments and our decisions were misguided. We accept that responsibility. We hope that Josh will continue to dedicate himself to rehabilitation and to becoming a better person and father. We will continue to support him in his efforts to continue counseling, and we hope that Josh and his family can find peace and a positive resolution. We have great respect and feel strongly about our support for the good people who work tirelessly and unconditionally to aid the victims of domestic violence and who bring awareness to the issue.We have been partners with My Sisters’ Place (a domestic violence shelter and advocate based in Westchester, New York) for nearly 20 years. The leadership of that organization has provided invaluable insight as we have considered our decisions in this matter. We value and respect their opinion, and we look forward to continuing to work with them in the future. Brown released a statement Tuesday before he was released by the Giants. Brown was suspended for one game at the beginning of the 2016 season following a May 2015 arrest for assaulting his wife. Brown returned to the Giants in Week 2. Last week, a new set of documents was made publicly available by the King County Sheriff’s Office out of Washington state, which included emails between Brown and his wife, and journal entries from 2013 when Brown was in psychotherapy. Molly had filed for divorce in 2013, prompting Brown to seek help. The divorce paperwork was later withdrawn. Molly filed for divorce from Brown following the May 2015 assault. Last week the NFL placed Brown on the Commissioner’s Exempt list, citing investigations into other potential incidents and stating that Brown was suspended only for the May 2015 incident. Molly Brown has told police that her husband has been abusive to her more than 20 times. 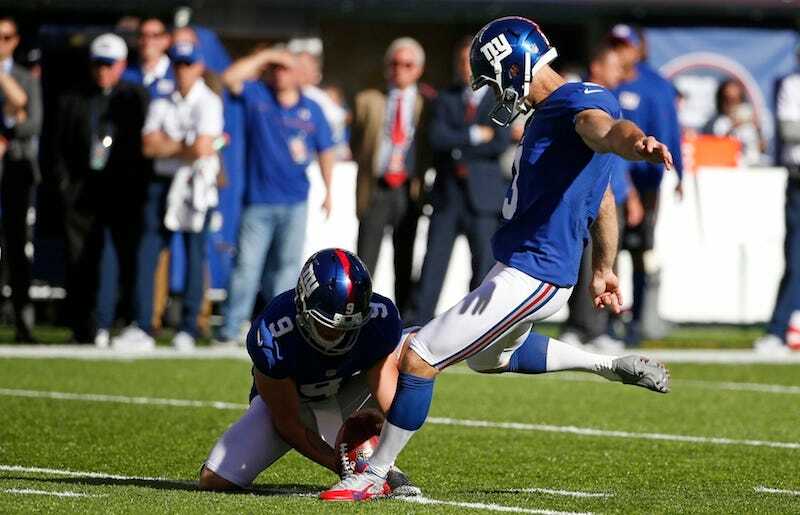 The Giants signed another placekicker ahead of the Week 7 game against the Rams in London. The NFL implemented a minimum six-game suspension for domestic violence in 2014, following the botched punishment of Ray Rice. Brown was given a reduced suspension before the case was closed by the Sheriff’s Office. The NFL has since reportedly attempted to deflect the blame for its hurried decision-making onto the NFLPA.